Construction of South Asia's longest suspension bridge begins - Integration Through Media ....! PARBAT: Parbat district which is known as the ‘district with the longest and highest suspension bridges in the country, is soon going to have another feather in its cap. The construction works of what is claimed to be the longest suspension bridge in South Asia have begun. The bridge will be 567 metres long and will connect Aduwabari of Pang, Kushma Municipality-1, Parbat district to Ramrekha of Baglung Municipality-1 in Baglung district. The bridge over the Kaligandaki river will be 162 metres high from the river level. 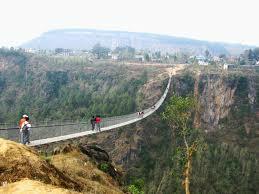 The Himshikhar Construction is building the suspension bridge at an estimated cost of Rs 69.1 million. A feasibility study for the construction of the suspension bridge had been carried out 16 years ago but this project has not been included in the local level plans. The construction on the bridge started from this year after National Assembly chairman Ganesh Prasad Timilsina took initiatives for its construction. Parbat district is Timilsina’s home constituency. The bridge is expected to be completed by mid-July two years from now, Kushma Municipality, Ward No 1 chair Devendra Subedi said.